The roles of the bridal party are critical to pulling off your dream wedding without a single hitch. After all, these ladies are more than the girls who will throw you a wild bachelorette party or ensure that the train of your wedding dress is absolutely spotless before you walk down the aisle. These are the girls who represent your closest female friends – and they were chosen to share in the most special day of your life. When it comes to the roles of the bridal party, it’s important to note that not everyone will get an equal share of the responsibility. Let’s explore the many roles of the bridal party, including what they’re expected to do. Think of the maid of honor as the VIP/executive assistant on your wedding day. She’s the special friend or sister who you couldn’t imagine life without – and you want to honor her special place in your heart. But like they say, with great power comes great responsibility. Your maid of honor should write a speech for the reception, plan your bridal shower/bachelorette party, help you with the planning, and generally just be there for you when you feel like pulling your hair out from wedding stress. 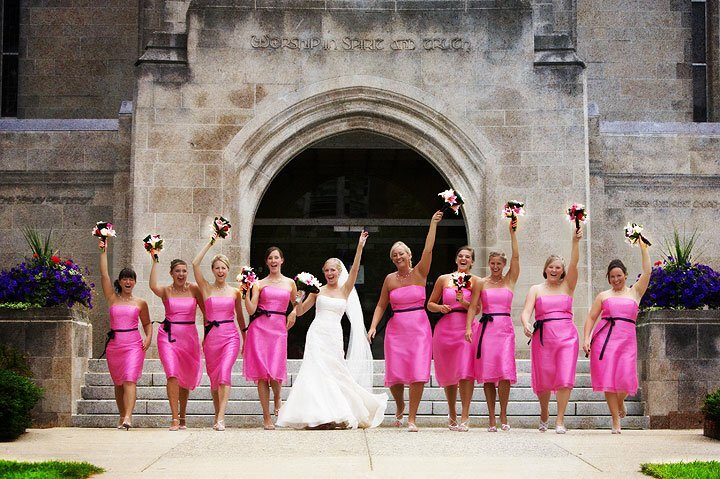 The bridesmaid is a good friend or sister who you want to honor with a special place in your wedding. While the bridesmaid doesn’t have as many responsibilities as your maid of honor, she should still be ready to help out when you need it. 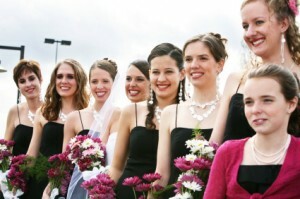 Bridesmaids should also help out the maid of honor with planning parties – including the ever-famous bachelorette party. Don’t forget to honor your mother during the happiest day of your life! The mother of the bride gets to walk down the aisle as well (and some brides even opt to have their moms walk with them). She should be primarily responsible for planning the bridal shower. If your mother is paying for part of the wedding, you should expect to involve her in a LOT of wedding planning. The flower girl should be a young girl (usually younger than ten) who is related to you or a relative of a close friend. Her job is to walk down the aisle, throw flowers, and look irresistibly adorable! Now that you know the roles of the bridal party, it’s time to let the special ladies in your life know just how much they mean to you with these wonderful titles. And when they send you a wedding gift, don’t forget to include a word of thanks for their time and efforts in helping out in your bridal party. Check out the beautiful thank you cards on SaveTheDateForLess.com. How Can I Limit the Size of My Bridal Party? Now that you’re getting married to the love of your life, you want all of your friends and loved ones to be part of your bridal party. You thought you could have a large group of your sisters and best friends in your bridal party – but unfortunately, it’s just not something you can do anymore. Perhaps the budget doesn’t allow for such a large bridal party, or maybe your bridal party will far outnumber his groomsmen. Whatever the case may be, you need to learn how to limit the size of your bridal party without putting precious friendships and bonds at risk. Not to worry – we’ve outlined the tips and techniques that will let you limit the size of your bridal party without risking the relationships you love. At first glance, destination weddings might seem like an expensive endeavor. After all, you have to plan for hotels, plane tickets, and a number of other costly expenses. But destination weddings also have an amazing ability to cut down on the number of guests who can afford to attend. No matter where the destination, having a wedding with only one hundred guests is a lot more affordable than a hometown wedding with 250 guests! If you want to save face, you can always blame your budget. If you’re worried that loved ones and friends will be hurt that they’re not in the wedding party, you can gently point out that you and your fiancé don’t have enough money for a large bridal party. You can also use this excuse if someone else is paying for your wedding. Finally, you can always have a family-only bridal party. This is a great option if you have the good fortune of having too many good friends to choose from. Have your sisters and future sisters-in-law make up your bridal party. That way, your friends won’t be hurt and you’ll be able to make everyone feel valued during your ceremony. If you really want to involve all of your closest friends in your wedding, consider having some friends read a poem or play a piece of music during your ceremony. Remember to ‘like’ us on Facebook to get up to 25% off your save the date cards! This offer ends September 30, 2012, so don’t miss out on this great deal! How Should I Choose My Bridal Party? The man of your dreams just proposed to you with a shining diamond, and you’ve just told your friends and family members the big news. Now that the dust has settled, it’s time to get started on wedding planning – and that includes choosing the loved ones who will make up your bridal party. For some brides, choosing the bridal party is a simple matter. They’ve had their bridesmaids in mind since they first started dating The One – and it only comes down to making a phone call or sending out an email to the lucky few. But for other brides, choosing the bridal party isn’t so easy. What happens if you have too many great friends to choose from? What if you have several sisters? What happens if your best friend happens to be a man? Take a deep breath and relax: we’ve outlined the best tips and techniques for choosing your bridal party. If you’re a stickler for tradition, choosing the bridal party will be relatively simple: your closest sister should be your maid of honor, with your remaining sisters and best friends as your bridesmaids. If you don’t have any sisters, your best friend or future sister-in-law should be your maid of honor. But today’s modern bride doesn’t have to follow these traditional rules. Therefore, don’t feel like you “should” choose your sister over your best friend, despite not being that close to her. Additionally, you don’t have to ignore your best friend just because he happens to be a man. These days, you can have a “man of honor” or as many bridesmaids as you want – it’s all up to you! If you’re fortunate to be blessed with plenty of best friends and sisters, you’ll need to be diplomatic when selecting your bridal party. If you have to leave some loved ones out, don’t make an announcement on Facebook – this can be very insensitive. Send a polite email or make a phone call. Let your other friends know that you would have loved for them to be bridesmaids, but your budget meant you could only choose a few (this is an especially good excuse if you’re not paying for the wedding). Consider asking them to play another role in your wedding, like reading a poem or playing a solo piece when everyone’s taking their seats at the ceremony. Now that you know how to choose your bridal party, you can focus on other things – like enjoying being engaged to the love of your life! Don’t forget to ‘like’ us on Facebook to get up to 25% off your save the date cards! Hurry, this offer ends September 30, 2012, so don’t miss out on this fantastic deal!